Want to quickly see how the open-source software Joomla works? You'll find a free and updated demo installation of Joomla here. Joomla CMS is a free open source content management system developed in PHP that was first released in September 2005 as a fork from Mambo. Since the release of its first version, 1.0, Joomla went through a lot of changes, bringing new features and functionality to the table with every major release. Joomla 1.5, which was released in 2008, used object oriented programming and software design patterns, and was the first version to benefit from long-term support until April 2012 when it reached the end of life. Joomla 2.5 was released in January 2012 and was the first major version for Joomla to support an MS SQL database. The same year, Joomla 3.0 was released in September, leading the way to new features like tagging, improved security or microdata. 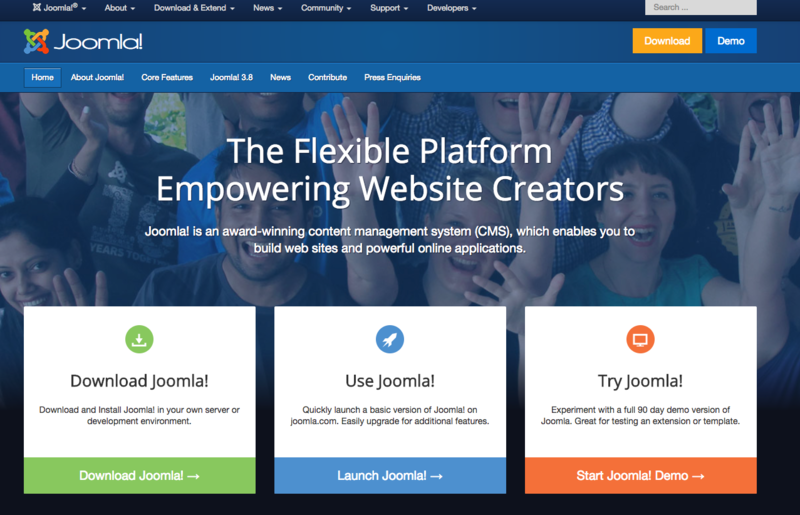 Joomla CMS uses a model–view–controller web application framework, making it easy for developers to create plugins, modules and extensions that would extend its functionality. All plugins, modules and extensions can be found in the Joomla Extensions Directory and are available for download, or you can check out their demo online to understand their features. 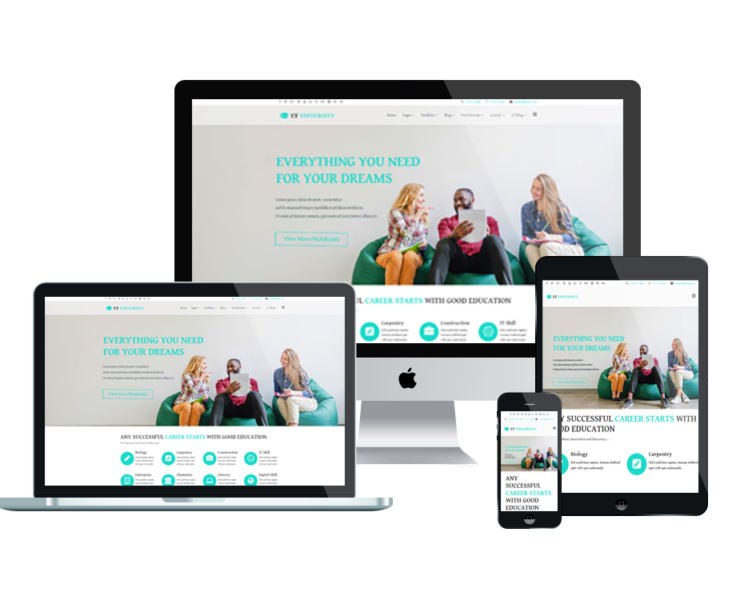 Some of the most popular third party providers of Joomla themes include Template Monster, Yootheme, JoomlArt and GavickPro. As far as content management goes, you can use the Joomla article manager that offers frontend editing and easy media files management through drag and drop functionality. You can also choose a third party content component like K2 or Easy Blog. Compared to any other CMS Joomla is pretty popular and is estimated to be the second most used content management system, after WordPress. 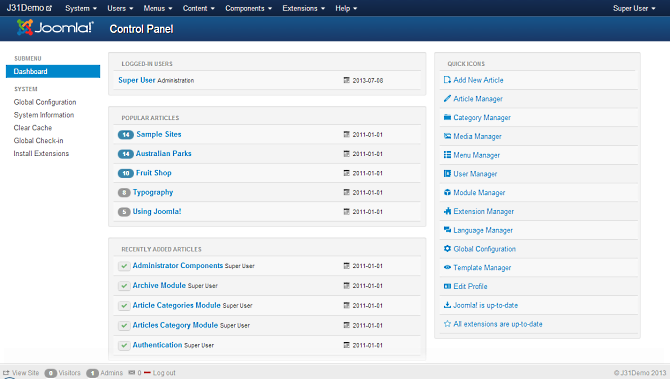 If you want to try Joomla online you can use our demo site for testing and see how the Joomla admin panel looks like. Using the site login you can get a preview of the admin demo and see how an online demo looks like with a basic Joomla theme installed. If you want to get a complete Joomla review you can download the software from the Joomla website and set up your own Joomla demo. This is a great way to get familiarized with creating a Joomla demo site from scratch, from content management to menus and modules. To customize the frontend of your Joomla demo you need to login to the backend and install a new page template using the Extensions manager. 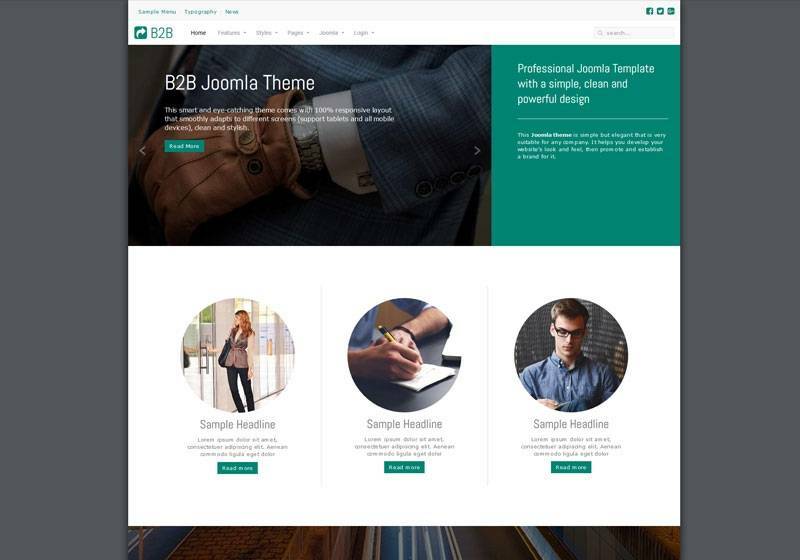 There are a lot of Joomla themes available created by third party developers, some of which are free. If you’re having problems with your demo installation you can search for a tutorial that will show you how to change the demo theme. The Joomla CMS is supported by a strong community of developers and other volunteers who contribute to the project. If you want to become a part of the project you can check out their community page and see how you can contribute and help spread the word about your Joomla website. Using Joomla as a CMS gives you access to a lot of cool features, allowing you to build and customize any type of website, from a simple presentation website to online magazines, ecommerce stores or corporate portals showcasing a lot of functionality. If you’re looking for some Joomla examples, some of the most popular websites and institutions decided to use Joomla to manage their content. Harvard University, IKEA, Holiday Inn, the online newspaper The Hill or the U.K National Crime Agency are just a few of the major organizations out there who decided to use the Joomla CMS. The latest version of Joomla, 3.8, was released in September 2017 and features code improvements and encryption support, as well as a Joomla! 4 compatibility layer. After the launch of Joomla 3.9, the CMS will move on the releasing Joomla 4 in 2018. Joomla 4 is set to introduce new features that will improve SEO, raise the minimum supported PHP version to PHP 7, as well as remove previously deprecated functionality. It will also showcase a new backend template with minimal options for a quick and easy administration and a new user interface based on Bootstrap 4. It will completely remove jQuery from its core, focus more on the user interface and faster page loading times. Joomla 4.0.0 Alpha 2 was released in November 2017 and is available for a demo download. The CMS is released under the GNU license and offers multilingual support.